The focal point is Amanda Mallorie, a single mother who has just lost her 20-something son, Robbie. But she has few people ready to grieve with her: Robbie was executed for killing multiple people during a mass-shooting at a South Dakota mall before Christmas four years earlier, at a time when he was experiencing a psychotic break. Now preparing to move closer to her remaining adult daughter, Amanda sorts through Robbie's things, trying to reconcile the son she loved with the object of hatred who destroyed so many lives. Among those things she finds a high-school class ring, but not Robbie's, and her quest to find its owner offers a chance to rescue some sense of the boy he was before everything changed. Pack employs a plot that isn't brand-new—Lionel Shriver's 2003 novel We Need to Talk About Kevin also took the point-of-view of a mass-killer's mother—but there's a deep warmth in the way she investigates Amanda's grief, her wariness of others and her guilt over not somehow preventing this tragedy. The novel takes several detours to show us the lives of others touched by Robbie's act—his defense attorney; a paraplegic survivor; the anguished mother of one victim—making it clear that there's no attempt to diminish the horror and violence of his crime. Pack also makes a kind of co-protagonist out of Steve, the owner of that mysterious class ring, who is trying to make amends for his own failings as a parent. With crisp, unfussy prose, Pack allows all of these characters to reveal the truth of their pain and their failings, whether self-inflicted or caused by someone else. Yet she's most interested in where we go from that pain, and how we can hold in our minds both the reality that someone has done terrible things, and the reality that those terrible things aren't the only part of that person. The emotional lesson here isn't as simple as "forgive and move on;" it's a thornier recognition that people are rarely as easily compartmentalized as our harshest judgments of their worst acts. There are pivotal moments when lives shift course, and the book's title is a mournful recollection of the boundless possibilities a parent can imagine for a child, until circumstance and individual choices narrow those possibilities. 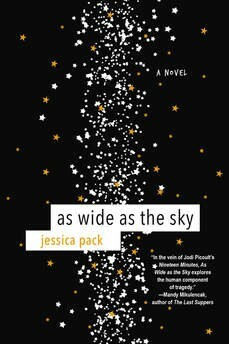 As Wide As the Sky asks what happens next, and dares to suggest that humans aren't monsters, and that there's a grace in allowing for the possibility of redemption. As Wide As the Sky publishes today (July 31) from Kensington Books. Jessica Pack/Josi Kilpack reads from and signs the book at The King's English bookshop on Tuesday, Aug. 7.